The Women’s Bar Association of Illinois (WBAI) is pleased to announce the call for nominations for its 2015 Top Women Lawyers in Leadership Awards. 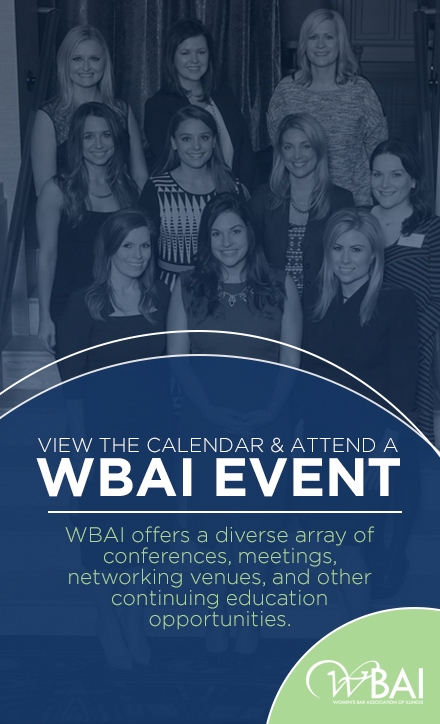 As an integral part of the WBAI’s mission to advance and protect the interests of women lawyers, the Top Women Lawyers in Leadership event was born out of the realization that, while the past 25 years have seen tremendous progress for women’s advancement in the legal profession, the percentages of women in leadership positions have remained stagnant. In the face of these statistics, the WBAI wants to celebrate the women lawyers who have become successful leaders in their chosen field, and to give these exceptional women a platform to share their formula for success with other women. Outstanding women lawyers (a) serving in a leadership role; (b) who have excelled within their chosen legal field; and (c) have gone beyond traditional mentoring to create new pathways for other women. Your relationship with the nominee, if any, or the circumstances under which you know the nominee. The Awards will be presented on Thursday, November 5, 2015 at 5:30 p.m. at the Grand Ballroom of the Hotel Allegro on 171 West Randolph Street in downtown Chicago. Prior to the event, each recipient will participate in a videotaped interview to be played at the event. Jennifer M. Mikulina, partner at McDermott Will & Emery; and Kay L. Schichtel, founding partner of Swanson, Martin & Bell, LLP.